Prepare these vegetable skewers ahead of time for a quick and easy dinner or snack. Just stir, chop, shake and grill! 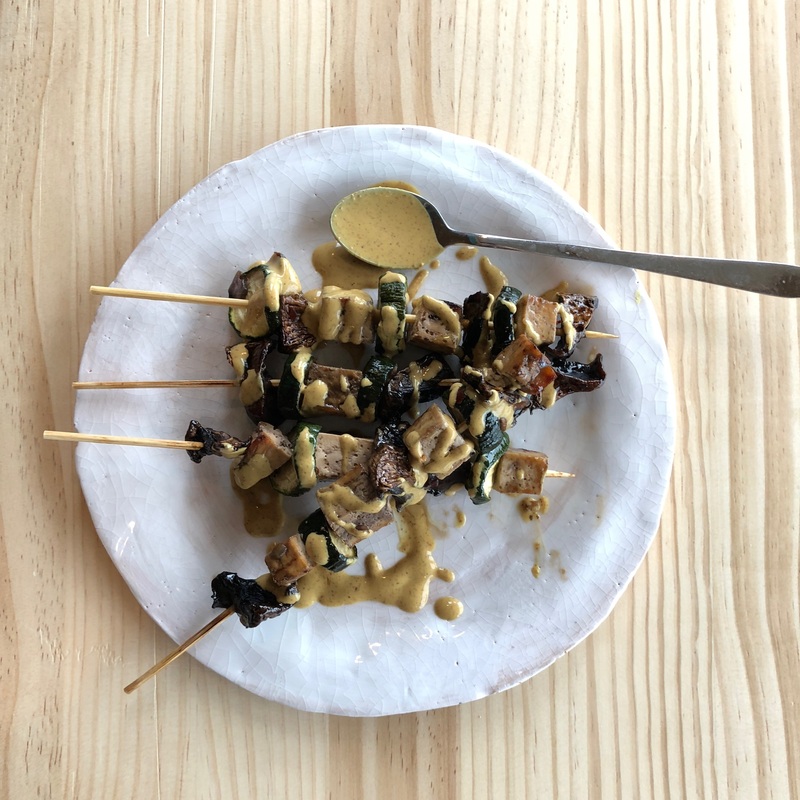 We have used tofu, courgette and mushrooms for our skewers, but onion, capsicum, aubergine and asparagus are also favourites. I also recommend you try this gorgeous satay sauce on hot buckwheat noodles, stir fry or roasted root vegetables. Keeps for up to 4 days in the fridge, in an airtight container or jar. Combine all marinade ingredients in a tupperware container with a lid, add tofu and vegetables. Close the lid and shake to coat all your vegetables in the sauce. Leave in the fridge for at least an hour, preferably 6-12 hours to get that great flavour soaking in. Soak your wooden skewers for 15-20 minutes, before threading on your tofu and vegetables. Grill or bbq on a medium to high heat, turning frequently and spooning over more marinade as they cook. Turmeric Satay Sauce: simply combine all ingredients together in a jar and shake until mixed, taste and season if necessary. These ingredients will emulsify and make a thick sauce. You can add water for a more liquid mix. Serve skewers with Turmeric Satay Sauce, or with rice for a hearty dinner.